Today's Web-savvy users often bypass traditional library catalogs for more interactive, tech-friendly interfaces. Help your library stand out within the crowded landscape of information providers with Marshall Breeding's new, highly practical guide to interactive next-generation library catalogs. Learn how to give your users access to a wide selection of print and electronic content with this jargon-free, step-by-step guide. Breeding outlines the important functions and features of next-gen catalogs, briefs you on all of the available commercial and open source software, and helps you select which products are right for your library's next-gen catalog. You'll learn to lay the groundwork for practical implementation, integrate the catalog into your existing technological environment, address a multitude of common implementation issues and concerns, and assess the impact of your catalog so you can demonstrate the change you led. A thorough glossary with definitions for all key terms in included, and Breeding presents the material in a manner that is both accessible to non-technical professionals and useful for systems librarians. "With his background, Breeding writes with authority on the transformation of the traditional online catalog into a discovery interface ... At 125 pages, the book provides a very useful guide and project outline of discovery interfaces for systems and technology librarians. Library administrators and staff who need an overview on the next generation library catalog will also benefit from Breeding's clear descriptions of this complex subject. The information in this book is applicable to any type of library, whether it is a public, academic, or special library." "Written in clear, understandable language, and would be a valuable asset for any library or librarian examining the range of possibilities for planning and implementation of such software." "Join leading expert Marshall Breeding as he tours the next generation of library catalogs, which use social features, patron input, and personalization…Administrators and reference librarians need to know about the 'next-gen catalog,' since it is expected to have Google-like features. However, the book may also be useful to system administrators who need to know the background requirements and specific technical requirements to implement such a system." "Extremely comprehensive. Clear definitions of terminology are provided throughout…Breeding has provided the framework to move forward and information and tools to get started. Means for measuring success are also described. A comprehnsive list of references and related resources is provided...The work is recommended for practitioners interested in the future of the catalogue." "The book aims to bring librarians up-to-pace with their increasingly tech-savvy patrons, presenting a 'jargon-free' guide to implementing a digital library catalog that's low on clutter and high on efficiency." "Written so that any librarian can understand, whether a cataloger, a technological librarian, or a librarian who is not tech-savvy, this book is useful to any person wishing to know more about next-gen catalogs, one seeking to implement next-gen catalogs, or for those who already have next-gen catalogs but wish to know how to go forth ... a valuable addition to any library seeking to gain knowledge about the future of catalogs." "Breeding ... provides a guide for information professionals of all skill levels and technological expertise to the next generation of library catalogs--which blend Web 2.0 technologies with library-centered content--and their increased importance." "[Breeding] provides an outstanding comparison list of OPAC vendors, including open-source options and specific features details, architecture, licensing restrictions, and number of installations, as well as links to explore the different interfaces. 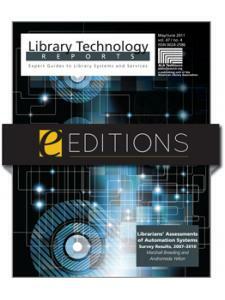 This informative text takes the legwork out of researching next-gen tools and add-ons for most standard OPACs and is applicable for any library maintaining an online catalog." 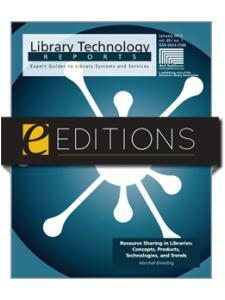 "The volume encompasses everything about latest library catalogs as one would expect and enables professionals to develop all-round skills not just of devising and planning a catalog strategy but implementing it, marketing it and even measuring it ... All in all, volume one is a great start to THE TECH SET and is a useful addition to the library professional's future guide." "Easy to read. Easy to understand. Clear. Straight-forward. Timely, and surprisingly up-to-date ... a good job of outlining the issues and framework for 'next generation' library catalogs."